As spring and summer approach, it will soon be time for company picnics and other employee gatherings. And what better way to celebrate a company function than with the most popular ice cream brand available, Good Humor. Let Frosty Bar Ice Cream cater to all your ice cream needs at your company event this year, bringing smiles to adults and children alike. We feature only the highest quality ice cream brands, like Good Humor, Popsicle, Klondike and Wells/Blue Bunny and are sure to have a treat for everyone. We will even bring an authentic original Good Humor truck to serve from! Our menu attempts to please all ages from child through adult, which is why we offer such an extensive amount of items to select from, including the famous Good Humor "Classics," such as Strawberry Shortcake, Chocolate Eclair, Toasted Almond, Candy Center Crunch and the Premium Vanilla Bar, as well as a variety of ice cream sandwiches and Good Humor's popular Sundae Cone. We also offer the popular Popsicle brand frozen novelties and carry at least 20 different varieties at all times, including the Firecracker, Rainbow Pop, Screwball and Snow Cone. 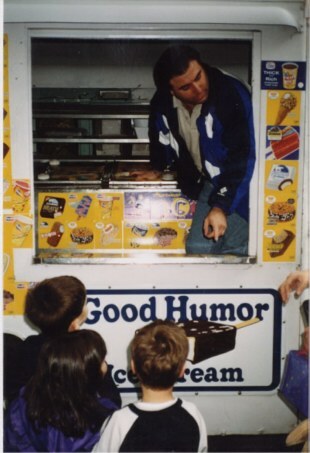 Why not make your company event one they will remember with Good Humor ice cream. We specialize in meeting your specific needs, and will accommodate any size event, with different pricing packages available. We look forward to being a part of your successful company event this year.